Mila, Marcus and Turtle are three rather unusual children. To start with, their parents are away in the circus, so the three kids live alone, taking care of themselves. Marcus's older sister, Mila, is full of ideas. In fact, every time she sneezes, she gets a new idea — some of them good (the best food for breakfast is chocolate ice cream), some of them not so good (a bird's nest makes a good hat). Younger sister Turtle likes to eat lettuce and growls a lot. Logical really, given that she thinks she's a turtle, but a bit confusing for those who just see a little girl. Marcus thinks he's the normal one, but how normal is someone who decides to travel from their bed all the way across their bedroom to the door without once touching the floor? One morning, Mila and Marcus dream up a plan to go from their apartment to the top of the town clock tower without ever setting foot on the ground. Fortunately for the siblings, they are very agile and acrobatic — thanks to their circus blood — so they stand a better chance than most of achieving their goal. But they still encounter a fair few challenges along the way. First, one of them has to carry Turtle. Then there's the obnoxious Splatley family to avoid. And what will they do when there are no more rooftops to run on? 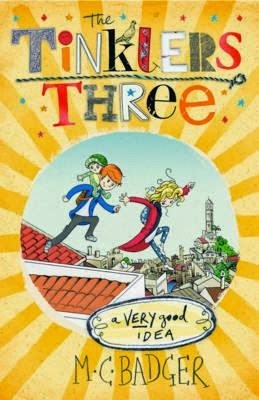 This is the first book in a deliciously funny new series for younger readers. Leigh Brown's illustrations, scattered throughout, are the perfect accompaniment to the wildly inventive text. Two more books, An Excellent Invention and The Coolest Pool, are released this month, with more to follow throughout 2014. Start collecting now — your young readers will thank you!